Available from Monday 15 September, 2003 at 10:00 am. Seat Z(¥ 1,500) is sold only on the performance day at the Box Office and exclusive Ticket Pia Offices. 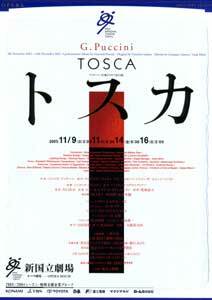 Tosca is a drama of love and hatred, which portrays the tragic destiny that hastens two lovers toward death. NNTT proudly presents the operatic masterpiece of Giacomo Puccini, whose emotionally charged music touches the heartstrings of the audience. Tosca is the most dramatic of all the operas written by the Italian composer. The sweet melody and powerful musical orchestration provides a sad yet beautiful portrayal of characters who are driven into a corner by harsh destiny. Particularly moving is the superb song “Vissi d’arte,” sung by the passionate singer Tosca, and the valedictory song “E lucevan le stelle” by Cavaradossi, which are demanding arias that truly test a singer’s ability. The audience can also look forward to this opera as a type of “voice entertainment,” that enables them to savor the particularities of each singer’s voice. Antonello Madau-Diaz’s direction portrays the limits of love, desire and death, realizing overwhelming dramatic effects. In the scene of Te Deum, where the excitement of the visual developments is heightened in harmony with the dynamic music, the prayers of the people intermingling on the splendid stage and the strong presence of Scarpia, the the incarnation of evil, enables the audience to enjoy the charm of opera. The confident production and gorgeous staging of the opera, which makes full use of the NNTT stage, will not fail to profoundly move the audience.